Our company is fully licensed and insured in the state of California. We service Malibu, Pacific Palisades, & Santa Monica and have highly trained and experienced staff ready to address your problem immediately. Give us a call at 310-421-2554, and we will listen to your animal problem, determine the most reasonable course of action, quote a price for services, and schedule an appointment for same-day or next-day service. We answer our phones 24/7, so don't hesitate to call us at any time! We pride ourselves on the quality of our work. We do not perform pest control services in Malibu, Pacific Palisades, & Santa Monica, and we do not exterminate or poison wildlife. We are professional wildlife control experts, and we employ humane and intelligent means for permanently solving wildlife conflicts. Trapping is an art that requires a lot of experience (not to mention the proper training, equipment, and licensing). 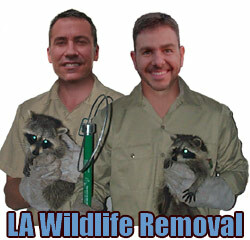 We truly believe that we are the best wildlife operators in Malibu, Pacific Palisades, & Santa Monica, and we back up our work with a guarantee. Email Time! RACOON PROBLEM (1) SMARTER THAN 3 PEST CONTROL COMPANIES ETC. I AM AT MY WHIT'S END. NO ONE HAS BEEN ABLE TO CATCH OR KILL THIS RODENT (RACCOON). IT HAS BEEN TEARING UP THE ROOF FOR OVER 1 YEAR. WE HAVE USED THE METAL CAGE WITH CAT FOOD, CORN ON THE COB, AND EVEN SARDINES. WE DID CATCH IT ONCE IN THE ATTIC. HOWEVER, IT WAS ON A WEEKEND AND THE EXTERMINATOR COULD NOT COME UNTIL MONDAY. BY THEN IT HAD BROKEN OUT OF THE COMMERCIAL WIRE CAGE. ACTUALLY DESTROYED IT. THIS THING IS A DEMON. ALL THE COMPANIES I HAVE HIRED CANNOT BELIEVE THEY cannot CATCH THIS THING. I HAVE LEFT SPOT LIGHTS ON EVEN A 600 WATT LIGHT. LAST NIGHT IT STARTED TEARING AT THE ROOF AT 9:00 P.M. AND CONTINUED UNTIL 6:00 A.M. IF WE GO OUT AND SHINE THE LIGHT IT RUNS OUT OF SIGHT UNTIL WE GO BACK IN. THEN IT CONTINUES TO SCRATCH AND CLAW ETC. IT HAS TORN INTO THE ATTIC 5 TIMES THROUGH EXHAUST FANS X 2 . I HAVE HAD THE ATTIC AND HOME CRITTER PROOFED AS MUCH AS POSSIBLE. IT KEEPS COMING BACK. IT CRAWLS UP THE STUCCO AND USE TO SPRING ONTO THE ROOF BY WAY OF AN OUTSIDE SPEAKER SYSTEM. I SAW IT ACTUALLY DOING IT. I REMOVED THE SPEAKER AND FOR ABOUT 3 MONTHS IT STAYED AWAY. NOW IT IS BACK. I THINK WHEN THEY WERE BUILDING OUR HOUSE AN ADULT RACCOON WAS REMOVED FROM THE ATTIC. THIS POSSIBLY COULD BE ONE OF HER OFFSPRING THAT KNOWS THIS AS "HOME ". I HAVE THROWN MOTH BALLS ALL OVER THE PLACE TO DETER IT. I LEAVE ALL OUTSIDE LIGHTS ON ALL NIGHT AND HAVE EVEN PLAYED LOUD MUSIC ALL NIGHT. IT DETERS IT HOWEVER, ONLY FOR A SHORT TIME. I AM LOOKING FOR SOME WARFIN PELLETS THAT CAUSE HEMORRHAGES INTERNALLY AND THEN THE RODENT GOES OFF TO DIE. HOPEFULLY NOT IN MY ATTIC. I THINK IT HAS NOT GOTTEN THROUGH TO THE ATTIC THIS TIME. WE HAVE HAD TO FIX 4 HUGE HOLES IT HAS MADE. I WANTED TO PUT THE POISON PELLETS INSIDE MARSHMALLOWS THAT RACCOON LIKE AND SEE IF THAT WOULD NOT MAKE IT RUN OFF AND DIE. LIKE I SAY I HAVE HIRED 3 DIFFERENT COMPANIES AND ALL HAVE FAILED IN CATCHING THIS THING. I ALSO HAD THIS RODENT SIT ON MY BACK BALCONY IN THE MIDDLE OF THE DAY. I AM AFRAID IT COULD BE RABID. ANY SUGGESTIONS SHORT OF MOVING !!! WOULD BE GREATLY APPRECIATED.